I moved to Los Angeles in 2001 and upon my arrival realized that I was going to need a new, but modest, audiophile system, for my previous system - which consisted of JBL theater speakers - weren't about to fit into my new 500 square foot studio apartment. So I trundled down to my then local audiophile shop where I was introduced to Paradigm's new Monitor Series loudspeakers, which were in their third incarnation if I'm not mistaken. It was love at first sight and then I heard them and was completely sold - never mind the fact that they were among the only affordable audiophile loudspeakers I encountered that fateful weekend. I ended up purchasing a pair of Monitor 7 floorstanding speakers along with a NAD 325BEE integrated amp and matching CD player, all for around $1,200. I had that system throughout college and well into my early professional career and to this day look back upon it fondly for it was not only affordable and easy to use but magnificent sounding too. 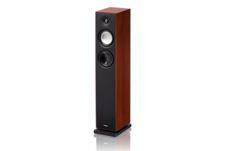 • Read more floorstanding speaker reviews by Home Theater Review staff. • Search for amps to drive the Monitor 7 v.7 in our Amplifier Review section. • Look for audiophile grade source components to pair with the Monitor 7 v.7. Fast forward to today and to an email from Paradigm telling me that they've revamped their Monitor line and asking me if I'd like to have a listen. Without hesitation I replied yes and a less than a week later a pair of brand new Monitor 7 loudspeakers arrived on my doorstep. Upon unboxing them I quickly realized these were not the Monitor 7s I had once owned or become accustomed to; the new Monitor 7s were a statement all their own. The question that remained however, was how would they stack up against other affordable loudspeakers in today's growing marketplace? The Monitor 7 is a two and a half way, three driver, compact floorstanding loudspeaker that retails for $449 each or $898 a pair. 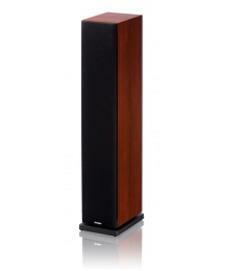 The speaker itself measures 36 inches tall by just under seven inches wide and nine inches deep. It weighs a scant 32.6 pounds though it feels more substantial than its weight would suggest. The Monitor 7's finish options include a traditional Black Ash or Paradigm's own Heritage Cherry; my review units shipped in Black Ash though all my previous Monitor 7 speakers were in some form of cherry finish. As for the Monitor 7's appearance, it is one that screams tailored versus budget for its clean lines, narrow profile and seamless, soft touch baffle give it a decidedly higher end look than its predecessors and competition - especially in its Heritage Cherry finish. The Monitor 7's new seamless baffle design is one that is reminiscent of another high-end speaker manufacturer, Magico, thanks to its uninterrupted lines and matte white drivers. The new plinth that attaches to the bottom of the Monitor 7 also helps dress up what would otherwise be an unassuming box speaker. There's even more good news when it comes to the Monitor 7's driver compliment. Starting with its five and a half inch Pure-Aluminum Bass/Midrange driver, which were introduced in Paradigm's costlier Reference speakers, the Monitor 7 is clearly the benefactor of Paradigm's trickle down philosophy. The Monitor 7 also gets an improved one inch Satin-Anodized Pure-Aluminum Dome tweeter as well as a five and a half inch Carbon-Infused Polypropylene Bass Cone, that when coupled with the retooled crossover give the Monitor 7 a reported frequency response of 48Hz to 22kHz on axis and 48Hz to 18kHz 30-degrees off axis. The Monitor 7 has a reported sensitivity of 91dB into an eight-Ohm load and is suitable for amplifiers and/or AV receivers ranging in power from 15 to 180 Watts per channel. For a more on the Monitor 7's specifications and advancements please visit its product page on the Paradigm website. My review pair of Monitor 7 loudspeakers arrived safely and securely despite FedEx's best attempts to damage them, evident in the various dents, gashes and slices found in both boxes. To say Paradigm packs their products well is an understatement for neither speaker suffered any damage despite the boxes being all but unusable for future travels. Paradigm also sent along a matching center channel, the Center 3, which complimented the Monitor 7s visually in its black ash finish. Unboxing the Monitor 7s is easy enough for one; though it's not as simple as simply removing the boxes for you do have to attach the included plinth to the bottom of each Monitor 7 using the supplied hardware. Once the plinths are in place setup is straightforward. The Monitor 7 has the ability to be bi-wired thanks to its dual five-way binding posts, which are recessed into the lower back portion of the speaker's cabinet just above the plinth. Because of their recessed nature, the binding posts are a little difficult to get a firm grip on which makes tightening them a little fussy but ultimately still possible. I didn't bi-wire the Monitor 7s; instead I used the supplied bridge straps and connected the speakers to my system using a pair of 12-foot Transparent Wave speaker cables with banana-terminated ends. To round out the Monitor 7's bottom end I went ahead and utilized one of my two JL Audio Fathom f110 subwoofers, which I crossed over at 50Hz and then later at the customary THX 80Hz. The Monitor 7s were connected to my NAD T757 AV receiver (review pending) and later to my reference Parasound 5250 v2 multi-channel amplifier with the NAD receiver acting as an AV preamp. Source components included the Sony BDP-S580 player which is a universal player capable of playing back everything from CDs and SACDs to Blu-ray discs, as well as an AppleTV connected to a Cambridge Audio DACMagic DAC. Transparent Link cabling was used throughout with the exception of HDMI, which was from Planet Waves. For video I utilized my new Panasonic plasma, the TC-P50GT30, as well as my Anthem LTX 500 LCOS projector. I placed the Monitor 7s approximately where my reference Bowers & Wilkins 800 Series Diamonds sat, which is roughly three and a half feet off my front wall with close to seven feet of distance between them and three feet of space along the outside edges between the speakers and my side walls. The room itself is 17 feet wide by 25 feet long with nine foot ceilings and is treated using GIK Acoustic products, including floor to ceiling bass traps in the corners and bass absorption along my back wall. I let the entire system play for a few days before beginning any critical evaluation. You'll want to be sure to give the Monitor 7s some break-in time, for out of the box they are a little thin but do settle down and fill out with time. Also, I didn't utilize any automated EQ such as Audyssey for this review, which allowed the Monitor 7s to perform au-naturale. I kicked things off with some UK born pop by way of Will Young and his album Leave Right Now (Jive). On the track "Grace" the Monitor 7s produced a strong, palpable center image that reached forward of the speakers' front baffles creating a slightly energetic presence. The resulting soundstage sat squarely between the left and right mains with solid depth but not a great deal of horizontal extension. On their own, the Monitor 7s sound a little lean, nothing too objectionable but nevertheless leaning towards the lean side of neutral. It's this tone or voicing that gives the Monitor 7 a very fast, dynamic demeanor; one that attempts to retrieve every detail and showcase it in a way few budget conscious speakers can. However, when I mated the Monitor 7s to one of my JL Audio Fathom f110 subwoofers, things changed and changed for the better. Obviously there was more weight to the performance, though depending upon where I crossed the two over I was treated to vastly different results. When crossed over close to the Monitor 7's low-end threshold the 7's voice remained largely unchanged, just picking up a few extra octaves of extension. When I crossed the sub over at the THX customary 80Hz the Monitor 7's voice changed a bit -becoming a bit more full-bodied throughout on its way to approaching neutral. Furthermore, when crossed over at 80Hz, the Monitor 7s opened up in terms of soundstage and began to sound and react much more like high quality monitor speakers than budget floorstanders. Read more about the performance of the Paradigm Monitor 7 v.7 speakers on Page 2.